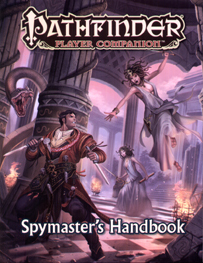 Gain the upper hand over your opponents by learning the deep, dark secrets they wish to keep hidden with Pathfinder Player Companion: Spymaster's Handbook. This manual of espionage gives you the tools to disguise your true loyalties, broker illicit information, and attempt stratagems of subterfuge that can change the outcome of an encounter before swords are even drawn! Exciting additions to the vigilante class, including the agathiel, Bellflower harvester, and teisatsu archetypes, as well as new social and vigilante talents. Scheming abilities for characters of any class, including backgrounds, story feats, spy-themed magic items, and espionage spells. A multitude of cunning new options, including alternate uses for skills and a system for buying and selling information.